Tyn Daga is a 4 piece band performing local music with a world of influences. Seasoned performers (from L to R) Paul Lewin (standing), Alan Burton, Gavin Nicol and Greg Dyer, all live in West Cornwall. 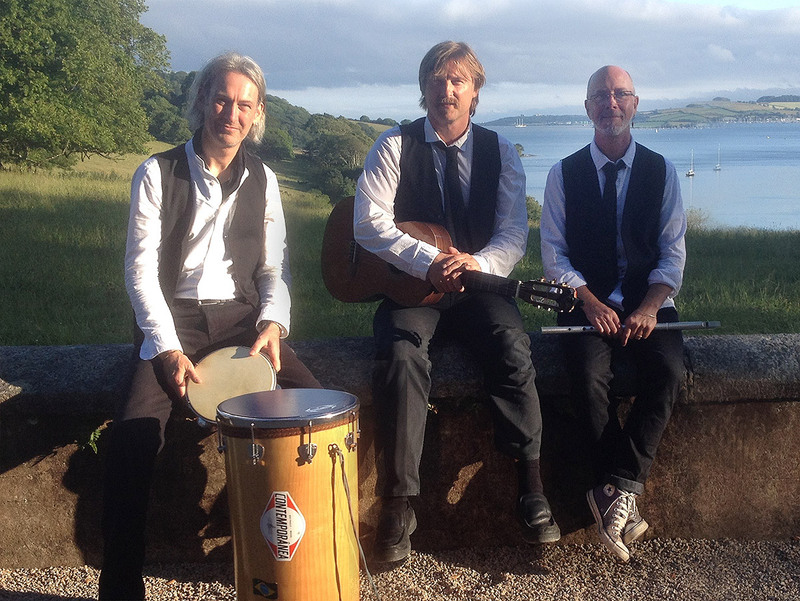 After playing together, and separately, in various combinations over the years, they formed Tyn Daga to perform an eclectic mix of much loved material including Celtic music, Balkan tunes, traditional songs from places as far flung as Madagascar to Macedonia, as well as songs written by the band, right here in West Cornwall. 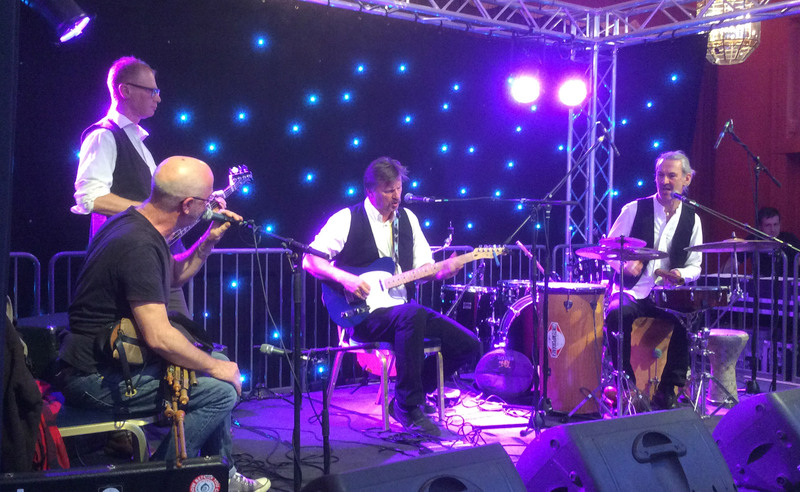 They have toured extensively in their own right, working with other musicians and bands such as James Fagan & Nancy Kerr, Afterhours, Kabasa, The Radio Rio Quartet, Claudia Caolin Flamenco and Baka Beyond, and have toured for Carn to Cove and Villages in Action as well as numerous festivals. The band features hypnotic, looping phrases from Alan’s Irish pipes or whistles, accompanied by Gavin’s acoustic guitar, over a percussion backing provided by Greg, using a wide variety of instruments; from Darabuka, to Flamenco Cajon, the shimmering Pandeiro and Berimbau from Brazil and other wonderful drums. As well as instrumental tunes, the band also plays lyrical songs. 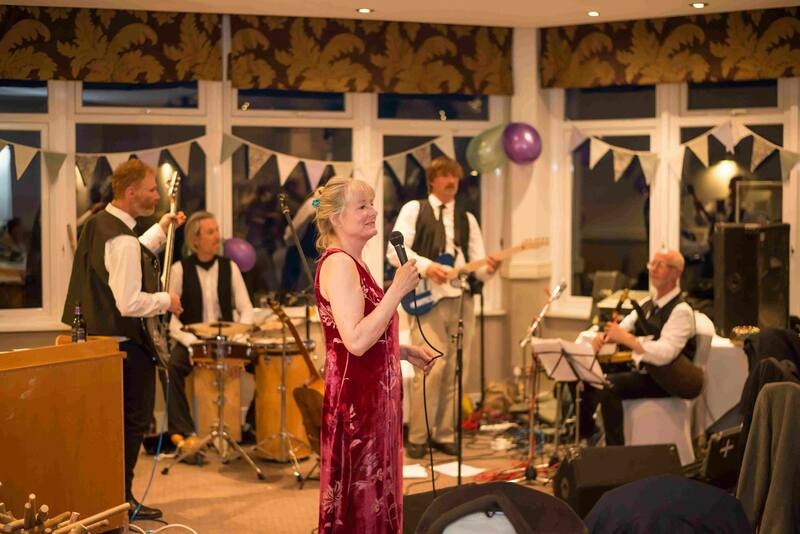 The group also perform at weddings, private parties and special events, as well as public and festival gigs. Gavin is a self-taught acoustic guitarist/singer/songwriter born and raised in St.Ives. Initially learning piano from the age of 4, he has been involved in numerous musical collaborations since his teens, his first band featuring school friend Alan (Burton) on drums. Alan and Gavin’s shared passion for “world music” originated in those days. Gavin’s 15 years in sustainable forest management, working across 5 continents provided many opportunities to immerse himself in local music traditions. He now divides his time between teaching conservation courses at Cornwall College and teaching guitar in schools. He is also a major supporter of local young performers and bands, running regular events in and around St.Ives and continues to write, record and perform his own songs. A native of West Penwith, Alan has had an eclectic career playing Uilleann (Irish) bagpipes, working with a variety of artists in folk and world music. He has appeared on Television and Radio around the globe. Though he has dedicated a lot of his musical energy learning Irish Traditional music, Alan’s deep love of Balkan and Arabic music is often hinted at in his compositions, and he is not adverse to taking risks with his playing to find new territory to explore. . Originating from the Lizard, Greg’s interest in guitar led him to Flamenco where he became spellbound by rhythm and has often travelled in Spain to study. He specialises now in Latin and Mediterranean percussion encompassing Afro Cuban, Iberian and Afro Brazilian as well as drawing inspiration from African, Arabic and Indian rhythms. Tyn Daga’s use of unusual time signatures and cadences provides plenty of fascination. Greg continues to play and compose for Spanish guitar. Known widely as a painter of Cornwall’s dramatic coastal landscape, accomplished guitarist Paul Lewin has a long held passion for music, and has been collaborating and playing for over 30 years, exploring wide ranging and eclectic tastes. Moving to West Cornwall in the late Eighties, he immersed himself in paining and the folk and world music scene, playing regularly at well known folk sessions, where he met Tyn Daga’s Alan Burton. Paul’s contribution to the band grew from accompanying us on selected gigs, to becoming our forth member, opening up new possibilities in our arrangements and development of our sound. His painting and love of music combine with his experimental work with natural soundscapes. You may be wondering about the band’s name. It’s derived from a lyric in one of our songs called ‘Mariner’s Rise’ – a dramatisation of the legend of the mother of the infamous Jan Tregeagle. In the song she wins a Dagger made of tin from ‘Knockers’ (underground spirits of Cornish myth) while wandering tunnels in a coastal mine and tosses it into the sea to appease the spirit of a dead mariner, who, while trapped beneath the waves had helped save her from drowning. Once in the possession of the dagger, he is able to liberate himself and so his spirit is able to pass on in peace.